Last March I went hiking with my nephew and his roommate to summit Mt. Woodson in order to get a photo op on a local landmark called "Potato Chip Rock." It is a thin slab of rock that juts out and looks like it could break at any moment. Amazingly, we made the steep four-mile hike uphill to the summit in about a year hour and that was with a ten-minute break! 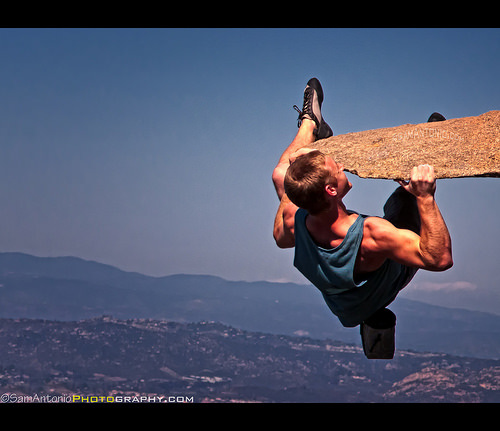 In the end, I never did get that photo op of myself on Potato Chip Rock since there was a long line (next time I should apply for a fast pass), besides after photographing Angkor Wat in Cambodia, everything else blades in comparison. I did get a chance to photograph other people on the rock like this rock climber. No, he isn’t falling; he was just playing around for the cameras. Check back for more of my photographs around my hometown of San Diego! Two more photos in the how to section. I gotta visit the potato chip!!!! Wow,,,superb shot Sam,,Lucky you! TFS. brilliant work – such strength!! Brave or foolhardy. I hope you were on firm ground when you took this ? [http://www.flickr.com/photos/dscottmcleod] I wish! LOL! 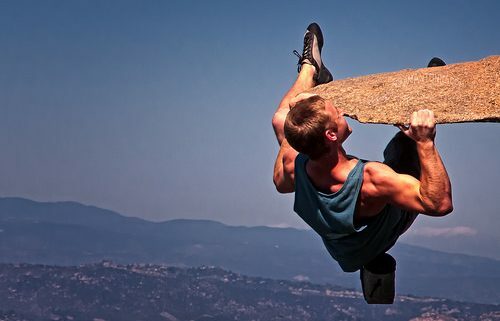 That would have been me a number of years ago when I was into rock climbing. A sensational shot. That was a quick walk uphill. show our appreciation of our images THROUGH. Wow, this is such a cool shot! [http://www.flickr.com/photos/samantonio/8550263479/sizes/z/in/photolist-e2ykrR-e2DYk7-e2DYk3-e3m8uQ-e2ykrT/]Another shot at a wider angle. Are you scared? yeah: no …. Awesome shot! [http://www.flickr.com/photos/bangbing] There is a 25 foot drop to catch you! LOL! Crazy….just plain crazy!!!!!!!!!!! Superb capture, Sam! Eeks…25 foot drop!!! Wow, looks scarey as hell! Was it really hanging out over nothing – as it looks? Cool shot. You have captured the essence of climbing quite well. Wooooow! Very good shot, expressive. A Brilliant Capture! Excellent Work! Well Done, My Friend! This is a personalized Friendship Award to you for being such a wonderful friend and/or in recognition of your great achievements in Art or Photography. This also serve as my heartfelt thanks for your lovely comments in my pics. For more details about this award, please click on the image. this reminds me of the opening scene from Stallone’s "Cliffhanger." Hard for me to look at…not a fan of heights. Nice one Sam. I remember Galen Rowell has a similar picture of himself like this. [http://www.flickr.com/photos/bazzastrassa] I posted this a couple of months ago on my Facebook and Google + pages. Who knows where it has traveled on the internet!? [http://www.flickr.com/photos/36647280@N07] [http://www.flickr.com/photos/beautythief] If you look at the second photo it does hang out over nothing. Yes, it very thin but I have seen large groups posing on the rock. Scary! Wow! Amazing scene! Great shot! Wow!! what a daring act! excellent capture! Wow ! Stunning shot ! Fantastic shot; you’ve created the illusion that he is in serious danger and that rock is about to snap. Thank you also for the commentary. Great image, it looks like it could break any second. Dramatic would be the descriptive word that would come to mind here! I haven’t been there, but it seems that many people try to climb like this. Is there any plateau beneath to save him if he accidentally fell? awesome pic of awesome action. Superb colors and frame!